Every one of the smaller sized opera companies in New York has its own style, its own mission, and its own constituency. The plucky Amore Opera sprang like a phoenix from the ashes of the Amato Opera Company; they serve their audience well by presenting honorable productions of operas-- both well known and undiscovered ones alike. We use the word "honorable" because there is no giant ego here trying to make an opera "relevant" by updating it or shoehorning it into a different locale. The composer and librettist are well served, as well as the singers and the audience. Here we have Artistic and Stage Director Nathan Hull who really understands opera and opera singers and lets them show their stuff in a highly legitimate fashion. Apparently, his view of the major themes of Giuseppi Verdi's Rigoletto is consonant with our own. He takes us exactly where librettist Francesco Maria Piave meant for us to be--16th c. Mantua, where a licentious Duke could surround himself with courtiers and employ a hunchback as his court jester. As we see it, and Mr. Hull as well, the major themes are 1) the corruption of the spirit that can occur when a body is deformed, 2) the possibility of fine and tender sentiments in even the most abrasive character, and 3) the supernatural belief in the effectiveness of a curse. When an individual is ostracized by society, his character gets deformed in any one of a number of possible ways. Rigoletto's eponymous hero is opera's version of Shakespeare's Richard III, trying to gain power over his tormentors. 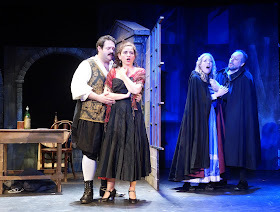 Rigoletto, while a holy terror at court, is a devoted loving father to Gilda; his failure is loving too much and being too restrictive of her freedom. She has not had the opportunity to develop her own judgment, a quality that is earned by learning from one's mistakes. There is something about a small house that lets the audience members feel everything more intensely. The theater in the Sheen Center on Bleeker Street only holds about 250 people and everyone gets to feel the annoyance of the courtiers, the callous indifference of the Duke, the shame of the abducted daughter, the grief of the father, and the flexible morality of the hired assassin Sparafucile. As Rigoletto, baritone Robert Garner turned in his reliably excellent performance with acting that matched vocalism; he permitted us to see the softer feelings which underlay the hunchback's abrasive behavior at court. His Act I aria was performed in front of the curtain, allowing the sets to be changed for the scene in his home, and allowing the audience a greater understanding of his character. Soprano Jessica Sandige made a fine Gilda, showing her character's innocence and devotion to her father by means of gesture and vocal color. Their duet in the second scene of Act I began in 3/4 time but the time signature changed as emotions grew in intensity. We are very much looking forward to Ms. Sandige's performance with Martina Arroyo's Prelude to Performance in July. And we hope she will use her excellent "Caro nome" as an audition piece. We first heard and reviewed tenor Aaron Blankfield four years ago at Chelsea Opera in the role of Goro and are glad to see his promise fulfilled. Last night he showed a completely different side of himself than he did recently as Nemorino. Going from that role to that of the Duke was like day into night but he acquitted himself well. He really shone in Act II with "Ella mi fu rapita!" We actually like Mr. Blankfield's voice best in the more piano passages, at which he excels. Another highlight of Act II was the scene in which Gilda confesses her shame to her father. She literally cannot face him. The emotionalism was intense. As Maddalena, mezzo-soprano Laura Virella was totally believable--just as vulnerable to the charms of the Duke as Gilda was--and convincingly persuasive with her brother as she begged him to spare the Duke's life, even as he sings the famous "La donna è mobile", driving the audience wild. The Act III quartet was brilliant with all four major character singing of their desires and fears. Most poignant is Rigoletto's wish for vengeance and Gilda's desire for forgiveness for the Duke. We enjoyed the substantial baritone of Sam Carl as the outraged Count of Monterone who lays his curse upon the Duke and Rigoletto, both indifferent to the violation of his daughter. And this was a spot where Mr. Hull's direction amplified the impact. In the same scene, the Count of Ceprano (baritone Thomas Geib) suffered extraordinary humiliation when children entered and literally placed horns on his head because the Duke was going to have his way with the Countess of Ceprano (mezzo-soprano Mary Gwynne Langston). Just another brilliant directorial touch that emphasized the cruelty of the court. Bass Peter Ludwig sang the role of Sparafucile in a menacing manner. Baritone Stuart Whalen took the role of Marullo and tenor Daniel Kerr sang the part of Borsa. As Giovanna, Gilda's guilty governess, Janelle Kirton overdid her gestures in an inappropriately modern fashion. Maestro Douglas Martin conducted with Verdian vigor. The strings produced a lovely carpet of sound, but the brass took awhile to calm down. We particularly liked Richard Paratley's flute solo. It is challenging for the artists to sing over the orchestra, which is not in a pit. But that is just a factor to be tolerated since there is no way to change it. Sets were simple but worked well. There was a throne and some panels to suggest the court. Rigoletto's terrace worked well with a street entrance and a rear one. Rigoletto's role in holding the ladder in the abduction scene was made clear. Sparafucile's tavern seemed barren and isolated which added to the feeling in Act III. Costumes were colorful and suggestive of the Renaissance. Choreography by Dana Boll was effective but unnecessary. One minor flaw of Amore Opera is tending to crowd the small stage with either too many people or too much scenery. Fine work was done by the chorus, under the direction of Susan Morton. Their voices added greatly to the storm scene, providing the sounds of the wind while the orchestra produced the thunder. If you wish to see the same cast, you will find them onstage next Saturday night. However, we understand that the other casts are equally fine and there are several performances from which to choose. There are even two Saturday matinees with an abridged version for children.